Sam Humphries has made a name for himself in sci-fi comics, but he’s brand new to DC and the world of the Green Lanterns. But that’s okay, so are his two heroes. GREEN LANTERNS, a new bi-monthly comic spinning out of Rebirth, finds Simon Baz and Jessica Cruz charged with keeping Earth and the rest of Sector 2814 safe from harm after Hal Jordan takes on a new assignment in space. Armed with the most powerful weapon in the known universe, Simon and Jessica will have to dig deep, learning to trust each other so they can work together to protect Earth…hopefully without causing too much damage to the place in the process. Humphries’ tale actually kicks off in June’s GREEN LANTERNS: REBIRTH #1, a comic he’s collaborating on with Geoff Johns and artist Ethan Van Sciver, the two creators behind 2004-2005’s GREEN LANTERN: REBIRTH. What was it like collaborating with Green Lantern royalty? How much trouble can Jessica and Simon expect out of the gate? And how will our heroes overcome great fear when they’re having a hard enough time overcoming their pasts? We got answers to these questions and more when spoke recently to Humphries about his exciting DC debut. You’ve described this series as being “Lethal Weapon with alien technology.” Can you explain what you meant by that? Absolutely. We’ve got two new Green Lanterns, they’re the new Green Lanterns of Earth—Jessica Cruz and Simon Baz. They’re rookies, but they’re strapped with the most powerful weapon in the DC Universe, and they’re still trying to figure out how it works. They’re partners, but they’re trying to determine what they think of each other and who they really are. They’re trying to figure out what it means to be a Green Lantern. At the same time, we’re bringing the entire Green Lantern mythos crashing down on their heads, and it all starts with the Red Lanterns. Bleez and Atrocitus have decided that Earth is crucial to the survival of the Red Lanterns, but the humans who live on it are not required. So it’s going to take all the courage that Jessica and Simon have to overcome their fear and protect Earth. You’re working with Robson Rocha on Green Lanterns #1, right? Yes! He’s a wonderful artist. This title is a really good fit for him. He’s really embracing these new characters. It’s really bringing out a version of Robson that no one’s seen before. I think even die-hard Robson fans are going to be blown away by what he delivers here. You’re also co-writing Green Lanterns: Rebirth #1 with Geoff Johns. It’s been a while since Geoff has worked on a Green Lantern title. How’s that been going? It’s been amazing. Geoff has been fantastic through the entire Rebirth process. He knows these characters better than anybody else. He has a knack for focusing on what’s important about the characters, the stakes, the story, an individual scene or line of dialog. Working with him has really been an education, and a really great honor. He hasn’t touched Green Lantern in three years, but he’s breaking that silence for us to work together. And we’re old friends, so it’s been a really special experience. Jessica Cruz and Simon Baz both have rough backgrounds in some ways. Will you be addressing that as this series gets started? That’s part of who these characters are. It’s part of their experiences that made them worthy of the Green Lantern ring. The ring chooses you for your ability to overcome great fear, and what they’ve been through, what their lives have been like is going to be a very crucial part of it. What Simon Baz has been through with the bombing that he got mixed up in but was in no way responsible for, we’re going to address that right off the bat in Rebirth. He’s going to get the opportunity to clear his name, but to do that he’s going to have to give up being Green Lantern, which is going to be a very difficult choice for him. He’s living with his sister, brother-in-law and little nephew, and people are spray painting “terrorist” on his house. 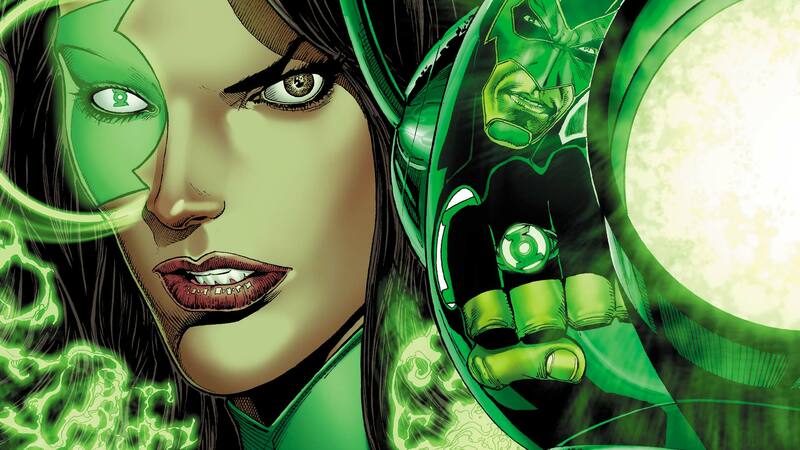 Then we’ve got Jessica Cruz, who locked herself in her apartment for three years because she witnessed the murder of her friends. She was worried that the murderers were going to come and try and find her to shut her up, and she’s right. But now she’s out, and she’s got a ring and they’ve got guns. So it’s going to get real interesting. How close is Green Lanterns going to intersect with the other bi-monthly Green Lantern title, HAL JORDAN AND THE GREEN LANTERN CORPS? Can you read them independently? Definitely. What’s amazing about these books is that they both justify their existence. Robert Venditti is a fantastic writer. He’s had an amazing tenure on Green Lantern that I’m excited to see him continue through Rebirth, and he’s got a story that takes place in space with Hal Jordan. I’ve got a story that takes place on Earth, and I’m writing two rookie Green Lanterns. We’ve both got such really interesting, meaty stories and characters. What’s going to be really cool is that we’re both on the same page about what a Green Lantern story is all about. It’s all about courage over fear. So even though we’re writing different stories that might be millions of light years apart, there’s going to be really interesting thematic connections. Really interesting emotional resonances between the books. This is the first time you’ve written for DC. How do you feel about being a part of it? Oh, I feel amazing. It’s wonderful. It’s a great company with great creators, editors and characters. It’s such an amazing legacy. The opportunity here with Rebirth is so strong and so empowering, I really can’t wait for people to see the whole line. Not just my book, but the whole line. The saga of Simon Baz and Jessica Cruz kicks off on June 1, 2016 with GREEN LANTERNS: REBIRTH #1 by Sam Humphries, Geoff Johns and Ethan Van Sciver. GREEN LANTERNS #1 by Sam Humphries and Robson Rocha will be available June 15, 2016 in print and as a digital download. The #DCTV Secrets of GOTHAM: Ep. 2.18 "Pinewood"